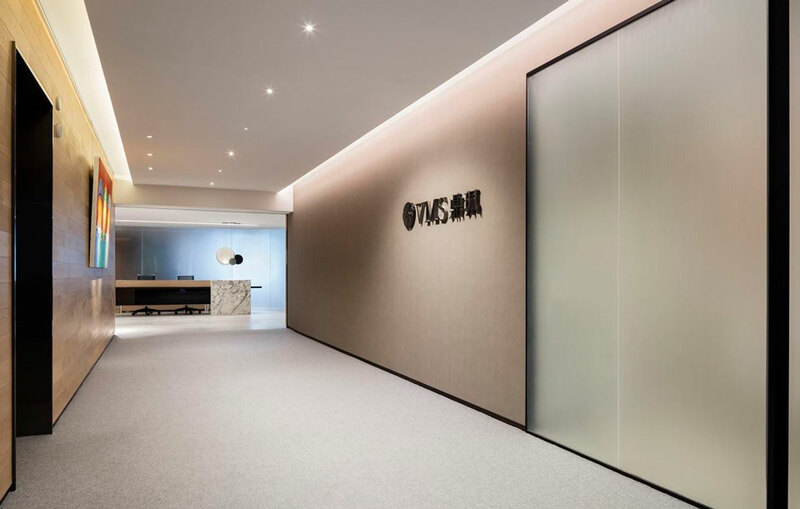 Based in Hong Kong, VMS Investment Group was designed by Aedas Interiors with the aim of providing an art gallery ambience. Warm, natural materials and a quiet color scheme predominate, ceding center stage to the firm’s impressive art collection displayed throughout. 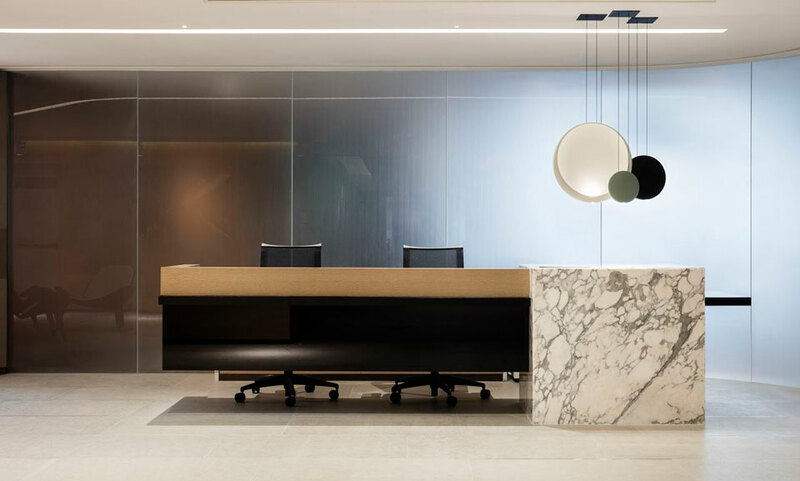 Suspended above the reception area is Vibia’s Cosmos by Lievore Altherr Molina. The LED-powered pendant consists of a cluster of minimalist, lacquered discs that recall intergalactic forms floating in space. Their white, black and grey tones perfectly pick up the marbled corner of the desk below. 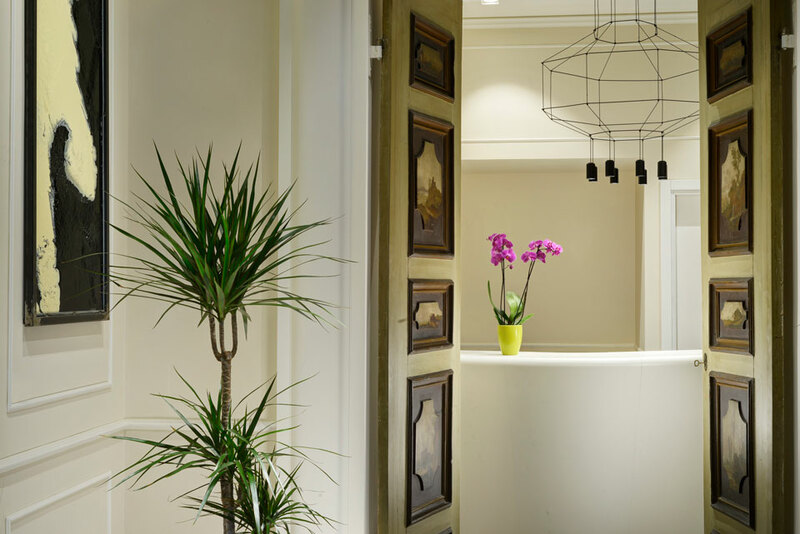 Located in a luxurious townhouse in the center of Perugia, Italy, the boutique Locanda della Posta hotel features minimalist décor displayed within a historic 18th-century building. Designed by Diego Cacciamani of A25design Studio, its spare entryway is illuminated by Arik Levy’s Wireflow chandelier for Vibia. Wireflow’s slim lines trace an airy, three-dimensional form, the black cables providing a graphic counterpoint to the reception area’s pale palette. 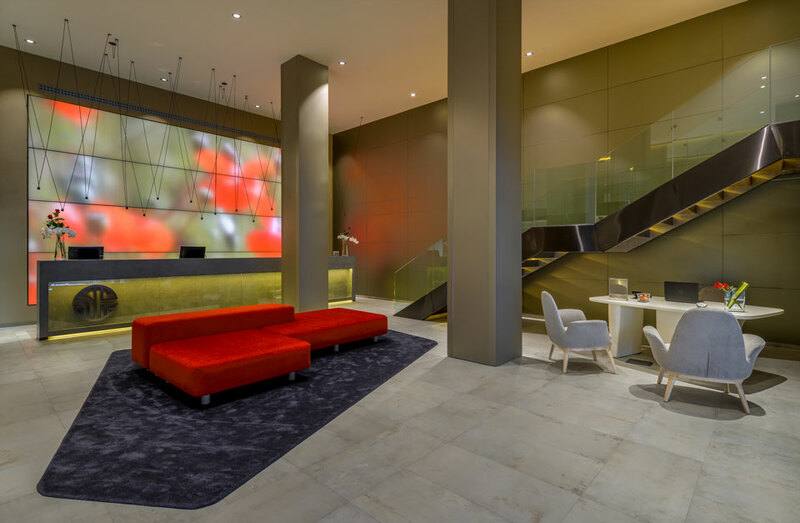 Situated in the tony Salamanca district of Madrid, Spain, the NH Collection Colon hotel welcomes visitors in a striking, subterranean entryway. An oversized image of bright orange blooms provides a dramatic backdrop for the reception desk, which is lit by Vibia’s Match pendant. Designed by Jordi Vilardell and Meritxell Vidal, the bespoke fixture features slender rods of aluminum tipped with LEDs, the jagged geometric forms directed downward in a sculptural focal point.